First of all–thank you to all who offered condolences over my lost bookmarks and ornaments. Both are still missing. And, I have tried everything that you all have suggested to recover bookmarks, with no success. But, oh well, I guess it’s my fresh start for the new year! We have been busy here getting ready for Christmas–sewing, knitting, decorating, buying last minute gifts, and shipping out boxes to family. 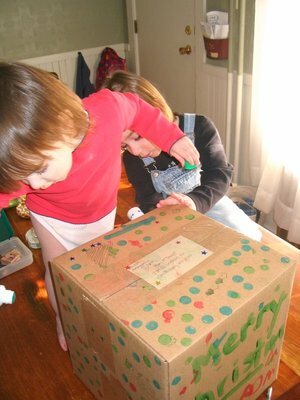 The girls have really gotten into the art of decorating the boxes before they go off to the post. Mary looks very focused in this picture, but in reality, she put more polka dots on her cheeks and the bottoms of her feet than on the box. I stayed up until 1:30 last night finishing this crib blanket/duvet cover for my nephew. 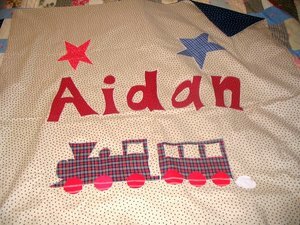 Emma drew his name in the cousin’s exchange, and his mom asked if I’d make a blanket cover for him. I made him a pillow with stars and similar colors for his birthday, so hopefully this will complete the set. It was a long night, but I was in the "sewing zone". I knew if I stopped I would put off finishing it until the very last minute. Now most of my projects involve knitting, which is nice because I can work on it anywhere. I don’t have to lock myself away in our guest room that I have taken over as my sewing room. It feels good to be able to slowly work through my Christmas Project List. I always seem to have big plans, and they rarely all get finished. But, I’m at the point now, that it is more important to me to enjoy Christmas with my family and revel in the joy of Christ’s birth, than to get each project completed. So nice when the whole family is involved in gift making. That crib blanket cover is so cute. Your sentiments are exactly right! that blanket cover is so cute…..he’s a lucky boy! and oh, very nice job on the duvet cover! so cute, that hand-painted package… that little duvet… nothing cuter! 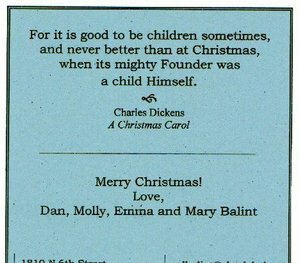 and wow, how I LOVE that quote by charles dickens on your christmas card. so true. and you are so kind to link me. I’m honored! thank you!